Gorumara National Park is located in the Dooars (rolling hill slopes) region of Jalpaiguri district in West Bengal. This small forest area famous for its natural population of the Great Indian one horned Rhinoceros was declared a wildlife sanctuary in the year 1949. Later in the year 1992, it was established as a National Park, comprising 80 km of diverse forests. The dooars lying in the Himalayan foothills has great natural beauty and is home to some of West Bengal's most varied flora and fauna. Gorumara park located on the bank of rivers Murti and Raidak has vegetation of riverine grasslands interspersed with savannah woodlands. Much of this forest is moist deciduous and sal (shorea robusta) is the most common and valuable tree. Teak, Simul, siris, Khair are also found here. The park is breathtaking with its rivers and mountain ranges. Besides the one horned rhinoceros, the fauna of the park include Indian Elephant, Indian Bison, leopard, different species of deer, turtles, pythons, monkeys etc. and more than 200 species of birds. The park is a birdwatcher's paradise with beautiful birds like Indian pied hornbill, Woodpeckers, Sunbird, fly catcher, Minivet, Drongo, Pheasants and many more migratory birds especially in winter. Brahmany duck is a regular visitor here and the birds can be watched from Suksukia, a bird watching point inside the park. Lataguri a small town adjacent to the park is the entry point. There are watch towers for viewing the animals inside the park. They are Jatraprasad Watch tower (named in memory of a legendary elephant of that name), Rhino observation point in front of the Gorumara forest bungalow, Old Khunia Watch Tower near the Murti forest bungalow and Suksukia Bird watching Point. Rhino observation point is the best place to observe wild animals like rhino, elephant, bison and deer as they regularly come to the salt reservoir just below the tower. 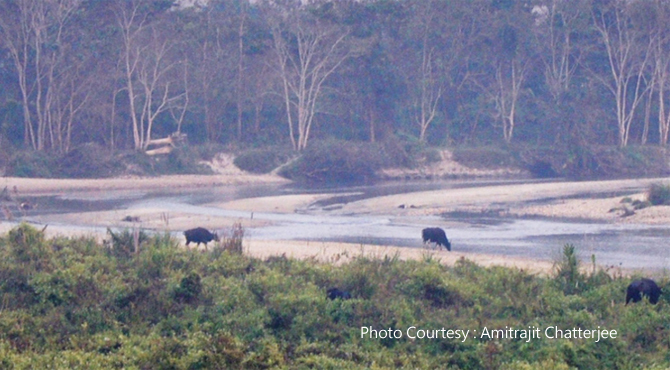 From Gorumara it is only a two hours ride to Jaldapara wild life sanctuary which is also located in the dooars.